The Midcoast Music Academy in Rockland is offering a class called Live Coding Using Sonic Pi taught by Tom Luther. Not to long ago I wrote a blog post on the academy at THIS LINK and a post that Tom Luther contributed to at THIS LINK. Live Coding is a way to create sound and music using simple computer code in real time. The program we use is called “Sonic Pi”, and it is designed for simplicity and flexibility. It’s language is easy enough to pick up quickly for a beginner, and it’s design is deep enough for a more advanced user. This class is for anyone, regardless of experience level with music or coding. Participants will learn the basics of the language, and how to use it to create simple to more complex pieces of music from a small set of tools. This will be a hands on class, and we are going to make a lot of noise! For more information and to register contact Midcoast Music Academy 207-701-7410 info@midcoastmusicacademy.com. 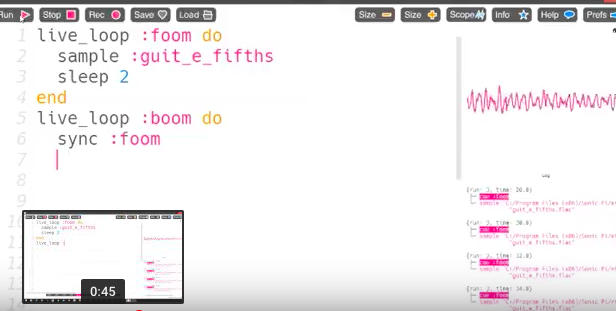 Take a look at this youtube video for a brief overview to get an idea of Sonic Pi.